We’ve put together a best beach tent list so that you can upgrade your next beach trip. We also answer a few questions on what to look for. Let’s get started. You want materials that offer protection from harmful UV rays without baking you. Lightweight polyester in a light color prevents the sun from reaching the interior, some blocking as much as 98% of UV rays, without attracting the heat. The result is a cooler interior with less harmful sun damage to your skin. Many of the best beach tent options offer sandbags or sand pockets. These are attached bags meant to be filled with sand and either placed on the interior edges or out with the stakes for further stability. One tip when dealing with sandbags: fill a plastic bag with sand instead and put inside. When you get ready to go, there’s no cleanup. Just remove the plastic bag and empty (take the empty bags away with you). Your tent is good to go. Most beach tents are automatic systems. They unroll much like an umbrella, making quick work of setting up. If you have children, the extra advantage is that no one is waiting around for a place to sit. Many of the tents on the list take less than thirty seconds to pop up (with only one person) and another thirty seconds to stake out. Get the kids involved scooping sand into plastic bags, and your tent is done in less than five minutes. You can get beach tents in sizes anywhere from small enough to fit a child to large enough for the whole family. You likely won’t be sleeping here, so you don’t need room to stand up, but if you have beach chairs, you might want a peak height of closer to five feet. It’s really convenient to have an extendable floor to allow for semi-protected sun exposure. Many tents with extendable floors use the exterior floor as a zip-up door should privacy be needed. These make sense for those with babies and small children that might need some privacy to change swimsuits or to breastfeed. The best beach tent for you should take this into account if privacy is one of your major selection criteria. Pacific Breeze’s beach tent is an easy to assemble, pop-up tent made from breathable polyester. It offers SPF coverage of over 50 and has a specially designed hub system that’s easy and quick for one person to set up and take down. It’s water repellant and features mesh windows for proper ventilation. It weighs just under four and a half pounds and packs down to a small size so you can carry it with you easily. When erected, it stands at a peak height of just under four feet with plenty of floor space for the family. It has a light, fiberglass frame and a PE floor. 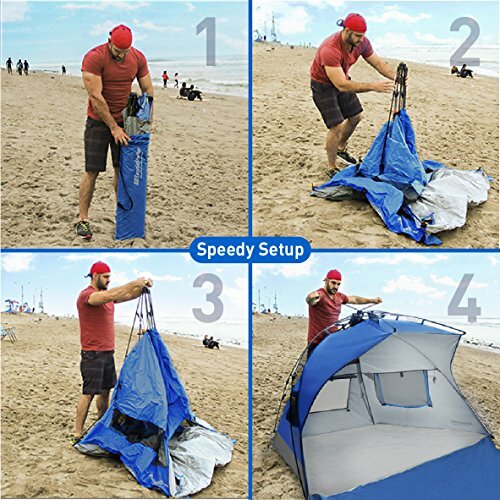 The beach tent comes with a carrying case and stakes for proper stability. 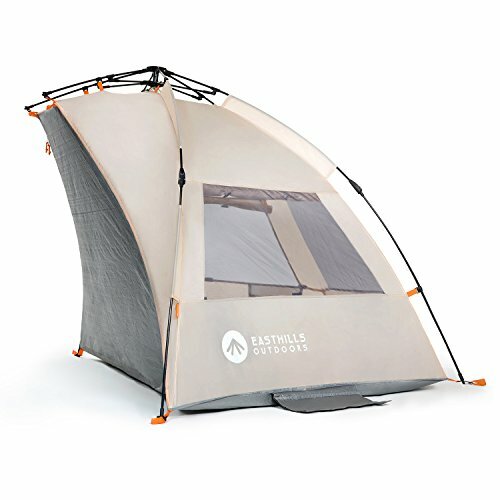 Arcshell offers an extra large tent that sets up with just the pull of a string. It’s a water repellent 3000mm PU on the interior. In terms of sun protection, the tent provides an SPF of 50 plus with 98% of UVA rays blocked. It has three extra large mesh windows for excellent ventilation. It comes with six extra large stakes, but it also uses sandbags for extra stability. The frame is fiberglass, and the entire thing weighs in at a little over six pounds, making it easy to cart to the beach. It’s 51 inches at peak height and 95 inches in length. It fits two people comfortably plus a few pieces of gear. There are storage pockets to store essentials. 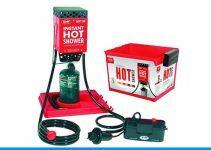 It complies with regulations for flame retardancy for tents. It’s a roomy option for couples spending time at the beach and needing some space between them. The sun shelter is a simple cover that offers basic protection from the sun during beach days. It’s a whopping 93.7 inches wide and 51.2 inches deep. That’s plenty for a couple of beach chairs without extending out into the sun if you don’t want to. The fabric has a silver undercoating that reduces heat and offers an SPF of 50 plus. It has heavy duty stakes made of steel instead of plastic, so once it’s secured, it will withstand wind or a little rain. It has three mesh windows that can be unrolled on either side of the shelter to provide a cross breeze. 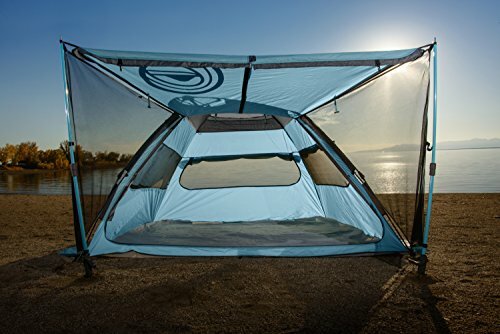 The beach tent weighs just over three pounds and packs down to a size of 40.5 inches wide and 5.2 inches across. It’s a simple, easy to assemble hoop style shelter that’s great for people who need a little shelter each time there’s a beach trip. Pacific Breeze Easy Up beach tent is another beach shelter that sets up in seconds through an industry leading hub design system. It weighs in at 4.5 pounds and is lightning fast to erect or dismantle. It gives you an SPF coverage of 50 plus, and it has two windows for extra ventilation and cross breezes. The peak height is 3’9″ feet, with a width of 4’1″ feet. At a depth of 7’3″ feet, it can fit anywhere from two sleeping individuals to four people sitting. It comes with stakes to secure the tent against high winds, but there are also sand pockets for easy security. The PE floor and polyester walls and fly are durable polyester that can be washed. The frame itself is lightweight fiberglass so your shade will last through quite a few beach trips. 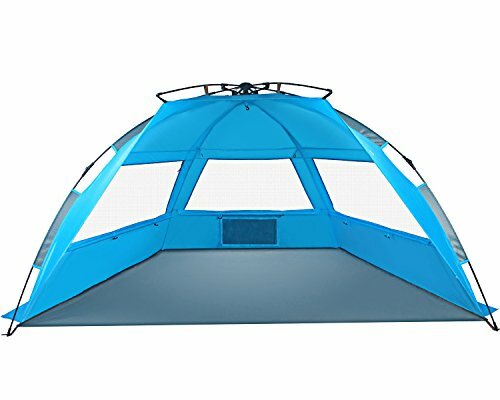 The Pacific Breeze Deluxe is another pop-up tent that pitches in seconds and is large enough for several people to stay out of the sun. It has an extendable floor that can be zipped up to provide a closure. It weighs a little over six pounds. When folded, it’s a compact size of just 38 inches long by just six inches wide. It’s a durable fiberglass frame over a polyester body and water resistant PE floor. It reaches four and a half feet at peak height with the same amount of space at depth so it can comfortably fit three to four people. The interior has several pockets to hold supplies and hooks for bags or towels. It comes with a carrying case, stakes, plus five sandbags for stability even in stronger beach winds. Watch the stitching along the sides of the tent where the wall meets the floor. Sometimes there are loose threads. 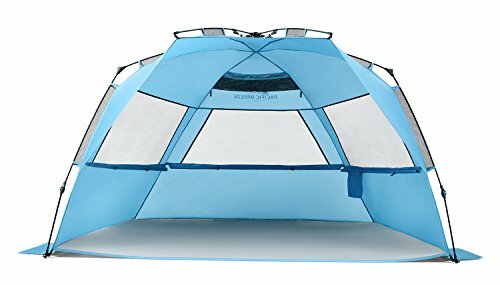 Other than that, this is a lightweight, durable tent good for beach trips and festivals. 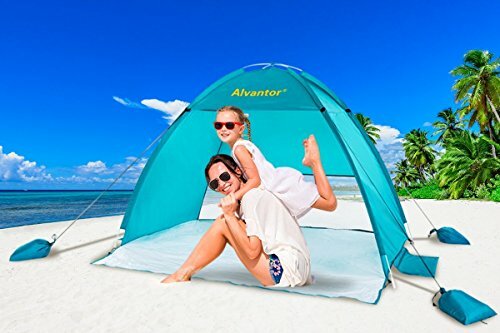 Alvantor’s lightweight beach shelter is a one-handed, pop up tent that fully assembles in thirty seconds or less. The back of the tent features a half panel of mesh to ensure full ventilation. The materials offer sun protection of SPF 50 plus. The materials are easy to carry and feature dirt and water resistant polyester walls and PE floor. The PVC frame supports the tent even when the wind picks up. It won’t collapse on itself and it reaches four feet in height with a width of 53 inches and a depth of 70. It fits two people very comfortably and is perfect for couples out for the day. The beach tent weighs in at just over two pounds and comes with stakes, sandbags, and a carry case, so everything is ready for transport. It’s probably too small for people with families or larger groups, but for those couples needing time alone, it’s perfect. Need more than just a basic beach shelter? 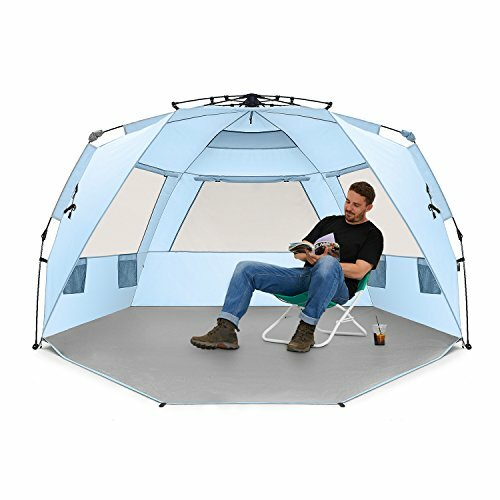 This two in one tent is a great option. It has not only sunshade but an awning that leads to a fully enclosed tent space. At night, the awning folds down to form the door of the tent. It’s a quick set up, taking less than thirty seconds with an automatic frame system that requires just one person to operate. It has 56 square feet of floor space and reaches a peak height of nearly five feet, so there’s room for the whole family. The sides have mesh windows, as well as the back, allowing maximum ventilation to flow through wherever the breeze is blowing. The walls are water-resistant polyester ripstop fabric, and the floor goes a step further with 300D Oxford floor material. It has durable zippers and a fiberglass frame, so it should last from season to season. This beach tent has nine sand pockets and comes with stakes for stability. It also has two poles to extend the canopy, two detachable side shades and two sand screws for tricky staking. Once folded down, it weighs just over 12 pounds, so it’s easily transported from the car to the beach. If you don’t need a lot of bells and whistles for your beach trip, EasyGo’s shelter is a good option. It’s a simple, one pull pop up shelter that sets up in seconds with just one person. Windows can be opened or closed to allow maximum ventilation. 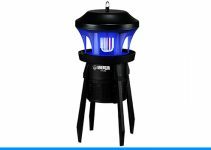 It has a sturdy fiberglass frame and comes with sand pockets and stakes for extra stability. Polyester walls provide SPF protection, and the tent fits up to four people sitting down. When you’re ready to go, it folds down to just four by four by four inches. Small enough to throw in a backpack. It weighs just over eight pounds and comes with a carry bag for easy transport. The newest version doesn’t have an extended floor, so you’ll have to find an extra tarp if you want that feature. 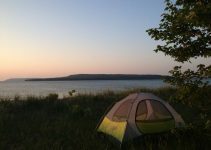 It pays off for being one of the simplest tents on the list. Easthills is an extra large sun shelter with polyester walls and roll-up windows on three sides for great views and really efficient ventilation no matter which way the breeze is blowing. It sets up in about 30 seconds with the pop-up frame. It weighs just eight pounds and reaches a peak height of nearly five feet. The interior has 99 inches of width and 53 inches from front to pack, plus another 53 inches of extendable floor. This gives the whole family space to sit in the shade or take turns sitting in sunlight. There are four internal mesh pouches for storage, and the extended floor can be zipped up to serve as a door for when you need to leave the tent temporarily or if you need privacy. It comes with a carry bag, ten plastic stakes, four guy lines and a storage pouch. There are no extra sandbags available, but with ten stakes it’s pretty sturdy. Improvise if you feel you need the extra weight. This is the smaller version of the tent listed above. 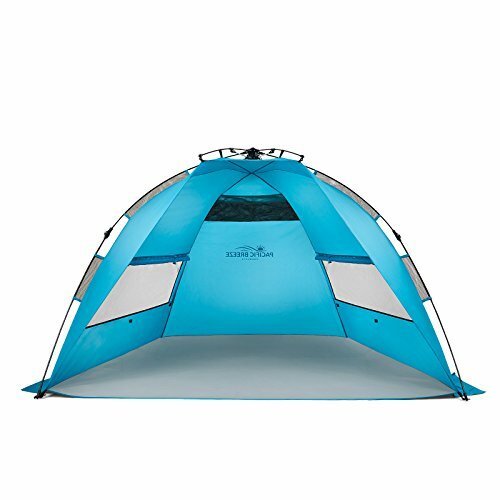 If you don’t need the extra large space, this smaller tent is lighter and easier to set up. It weighs just five pounds and has a peak height of just over four feet. The instructions are sewn into the fabric of the tent to make it easier for you to keep up with them, but the shelter itself is simple to pitch. It offers you SPF coverage of 50 plus, and it blocks 97.5% of UV rays. The material is a water-resistant, dirt-resistant polyester. There’s plenty of ventilation with mesh windows on three sides, so you get a breeze no matter which way it’s blowing. Four mesh pockets hold the essentials in plain sight inside. The extended floor zips up just like the larger version in case you need privacy or need to be away from the tent. When you’re done, it folds down to about 39 inches long and just over eight inches wide. It includes a carry bag, four guy lines, and tent stakes, plus a storage pouch for both of those.